Skipping Confirmation Box with ?direct=1 issues - Kantu - Forum for Kantu Task and Test Automation and the free OCR API. 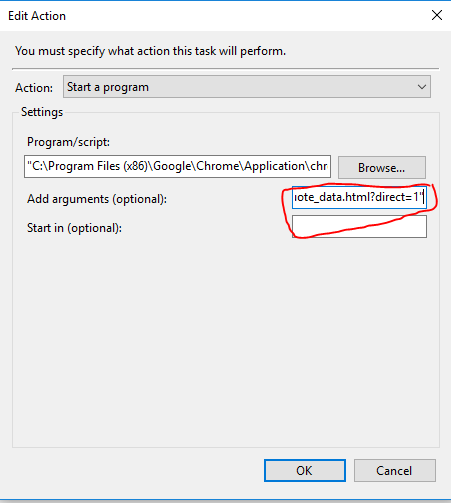 I am still having issues when adding ?direct=1 to the “Add Arguments” section within Windows Task Scheduler. Access to file URLs is enabled withing extension settings. and am using v4.0.1 as suggested. I am able to run the macro via the bookmark option. Any other help or suggestions would be much appreciated! objShell.Run "chrome" & " file:///C:\Users\myname\Downloads\quote_data.html&direct=1"
Now point Task Scheduler to launch this script instead. Let me know how you get on; I’m interested to see if you have any additional problems running from the commandline beyond launching Kantu. The problem is that the ? was converted to %3F - but I am not sure how to fix it. Seeing the complete string in the box might help. I agree with @TheWhippinpost - better call a batch file, VBS or Powershell script from the task scheduler. It gives you better control for debugging and error handling. Here is the full string. Reading through the replies here realizing I am so far out of my element it’s not even funny! This seems to work except I changed the &direct=1 to ?direct=1. Assuming if I want to add the other command lines I should just be able to add to the path using “&”?